Perched at the end of a long drive, surrounded by palms, pointy trees, and trimmed hedges, the house was smaller than he expected. Red tile roof and white window frames. Very English. There was a long shaded porch where Premchand imagined colonials drinking their cocktails. Inside, the floors were dark, everything swept and shiny. “This is all from the movie,” Amy said, looking at the furniture and Chinese ceramics. “Real,” Amy smiled, “but not the one Karen Blixen really stepped on.” She wore sneakers and khaki shorts, his wife’s brown sweater. Hair in a ponytail. She bounced lightly on her heels. Premchand smiled. He couldn’t remember where he had heard about the lions. Was it in the movie? He and Urmila had rented Out of Africa one night when Sunil was out with friends. Meryl Streep’s white suit and white hats, curly brown hair: Doesn’t it matter to you I’m another man’s wife? He couldn’t remember what Robert Redford had said in response, only the hazy yellow-green plain behind his head. The silly upswell of music that Urmila had thought romantic. Clouds slid over them and shaded the grassy expanse behind the house. Sunil squinted toward the horizon, and Premchand watched the way he moved gracefully through the museum, jaw pulled back in thought, arms crossed, then his hand on his wife’s arm, leaning into her ear, a flash of smile. The way his thumbs rubbed against each other when he clasped his hands behind his back. He felt he’d never witnessed his son’s life in this much color and detail. Premchand now saw this person, this being made from himself, the black stubble on Sunil’s face, with sudden clarity and curiosity. He was also seeing his son in love, his son married, intimate glimpses that he would likely not witness again for a long time. In 2007, my parents-in-law planned a return trip to Nairobi, where they were born, from their home of more than 40 years in Minneapolis. A few years before, my husband and I had spent time with his relatives in London, but I hadn’t yet met the Nairobi family. Because they were traveling in September, my husband couldn’t take the time off from teaching, but I decided to go along—and bring my dad. I’d long wanted to take my father to Kenya, to show him the country I’d lived in for a few months before starting college. I knew he’d love visiting the birthplace of human civilization and seeing the famous animals. I had toured Nairobi before, but my husband’s family took us to many places I had never seen. As a 17-year-old preparing for a teaching internship and homestay in a tiny village in Kenya’s Rift Valley, I had read Isak Dinesen’s Out of Africa. 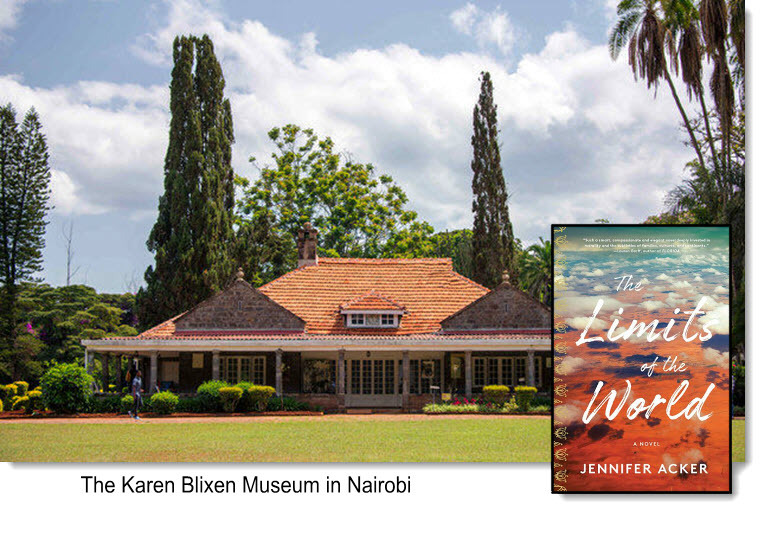 I had known that “Isak” was a pen name—Karen her birth name and Blixen her husband’s surname—but I hadn’t been to her former home. Given the epic scale of the memoir’s saga, I was surprised by how small her Nairobi bungalow was—as Premchand notes in the opening line. And it was hard to imagine the wilderness that had surrounded it when she lived there in the nineteen-teens and -twenties. When Dinesen left Kenya in 1931, she sold the land to a developer; the suburb that sprung on her farm’s former land is called Karen. As a Westerner writing about Kenya, it’s impossible not to invoke Out of Africa. The Hollywood allure of the colonial period, no matter how damaging to real people in actuality, is hard to escape. So I wanted to imbue this scene with the fraught echoes of the colonial time. I wanted to set an important familial conflict inside this space, and it also appealed to me to create a tense and explosive dialogue inside a setting typically hushed and reverent, such as a museum. The irreverence begins when Amy notes the inauthenticity of some of the artifacts, and then Sunil steps over the barrier rope that is supposed to keep visitors away from the furniture. This makes his father nervous, and he feels the eyes of a European tourist family upon him. Sunil and his father argue over the wisdom of subsidizing his mother’s store (she sells artisanal Kenyan crafts in a Columbus, Ohio mall). At the end of the scene, Sunil is so distressed that he knocks over a porcelain vase. This shattering, and Premchand, an inheritor of Britain’s colonial legacy, being left to pick up the pieces, felt fitting to me on both a narrative and symbolic level. Learn more about The Limits of the World – the debut novel of Jennifer Acker.